Introducing an innovative single player/upgradeable Head Restraint DVD System. This system allows you to select the best option to fit your needs. 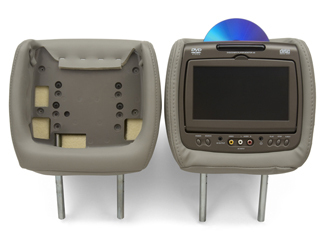 The kit comes with a passenger side head restraint complete with DVD player / monitor, and a driver’s side head restraint `shell` excluding the electronics. The electronics are available separately so you can choose either a dual player system (by adding the player/monitor), or a single player system (by adding just the monitor). Both electronic units have audio/video input jacks conveniently located on the front. Monitors on each unit are adjustable for optimal viewing angles. Regardless of which option you select, the electronics can be quickly and easily installed in the driver’s head restraint.